You’ve Got an Integrated Campaign. Direct Mail Evolves. Facing competition from electronic solutions, direct mail evolves by embracing new technologies like omni-channel marketing, augmented reality (AR), and reporting and analytics. Print providers and direct mail houses are moving into the era of digital transformation by investing in new technology trends and leveraging the value of digital color printing. Innovative mailers merge their experience in creating printed output that is physical and tactile with virtual solutions to ensure print remains relevant and desired. Above: Kodak offers a range of digital printing solutions to support a variety of digitally printed applications, including direct mail. Direct mail evolves as new innovations in print emerge such as the continued development of hardware including production inkjet technology, advancements in electrophotographic (EP) printing, and embellishment tools; software solutions like omni-channel communications, variable data, AR, and real-time reporting; as well as initiatives from the USPS. With this onset of technology, direct mail expands into new markets including luxury products, loyalty programs, and mag-a-logs. Great strides in print quality, speed, and flexibility allow inkjet to complete more jobs for direct mail houses at faster speeds and lower costs, says Brian Dollard, director, strategic planning and business development, commercial & industrial printing business group, Ricoh USA, Inc. In fact, the savings inkjet provides is increasingly important. “Postal costs continue to go up, cutting into mail’s margins. Direct mail houses need to seize on cost savings where they can to mitigate those rising costs,” adds Dollard. From his experience, customers in the direct mail space monitor rising postal costs and what it means for direct mail’s future. Technology improves to make a variety of print types formerly associated with only high-end presses more accessible, such as full-color items. 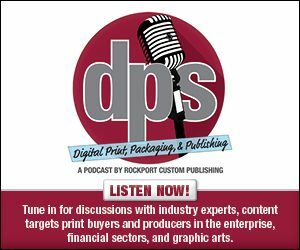 “Today’s inkjet presses are incredible at printing on a variety of media, giving marketers true creative flexibility along with operating costs they can afford,” comments Dollard. According to Corwin, mail finishing equipment must not only operate at high-volume production speeds but since most materials are time sensitive, the equipment should be dependable and maintain uptimes of 99 percent with no room for downtime during the final phase of the production process. In addition, equipment changeovers should be easy to accommodate add-on features including card tip-ons, re-moist glue lines, BRM postcards, and perforations. Advancements in digital printing technology attract new verticals to the direct mail space, including luxury products and services. This segment is currently increasing the use of print for both acquisition and retention direct mail programs. “These high-end mailings are designed to support their brand individuality and may feature unique papers, soft-touch lamination, exquisite product photography, and booklets or mini catalogs that seem to be begging to be displayed on your coffee table. When done properly, the experience is like receiving a gift in your mailbox,” says Will Mansfield, worldwide product marketing & category management, enterprise inkjet systems, Eastman Kodak Company. Loyalty programs take advantage of personalized printed direct mail as well. With these programs, retailers, financial institutions, and nonprofit groups collect and acquire massive amounts of customer data. According to Mansfield, personalized direct mail is on the rise with practically every firm that maintains a customer loyalty program as a means of customer retention. Additionally, mag-a-logs, which blend educational and marketing materials into a single printed piece to create a mini magazine or multi-page flyer, are more common. “Think of it as a magazine, plus a catalog, plus a personalized direct mail offer,” explains Mansfield. By providing helpful, timely information in an attractive printed piece, he believes marketers learn they can deliver marketing messages more effectively. Mag-a-logs are also used for both retention and acquisition. Digital print technology enables the creation of new programs and features from mailing delivery companies as well. For example, the USPS makes significant strides with the Informed Delivery program, which combines digital communications with a printed mail piece. According to Scott Eganhouse, VP, TEC Mailing Solutions, Informed Delivery is a free service that sends a daily email with a grayscale image of each mail piece coming that day for people enrolled in the service. Through a USPS portal, mail producers can swap out the grayscale image with a color image of the mail piece, including a call to action. “The open rate is 72.5 percent with a click through of 4.92 percent that compares to a 0.6 percent open rate for email campaigns,” says Eganhouse. Common challenges faced by direct mailers focus on quality and time to market, whereas more modern challenges are complex and include data mining and capital investment. Traditionally, direct mailers were concerned about pre-printed stocks, data quality, and quick turn jobs. While digital printing addressed pre-printed stocks, data quality and time to market are still challenges. Direct mailers also have to worry about getting the right content and targeting rules to make each piece as effective as can be, says Patrick Kehoe, EVP product management, Messagepoint. “With digital printing, it is much easier to create champion/challenger models for each campaign and to extend A/B testing to multi-variant testing,” he continues. Additionally, it’s important that personalization tools are coordinated between the creative, production, and measurement teams, which Kehoe says can be challenging. When executed correctly, it allows a direct mailer to be a valued partner with the customer. Tony Hodgson, head of marketing, locr, believes that in the past, a successful direct mail campaign was largely based on a company’s contact list and offer. “You created one generic message and sent it to as many qualified people as possible,” he explains. Rising postage costs and other factors are eliminating the days of mass mailings. According to Hodgson, direct mail today needs to be more precisely targeted, personalized, and relevant to grab the attention of recipients. While data analytics present an opportunity for direct mailers, it can also be a threat for those sitting on the sidelines. According to Eganhouse, data processing departments will go through a dramatic shift in how data is processed and consumed from on-premise software to cloud-based data analytics platforms that can prepare data for mailing. “Since data processing departments tend to be from the ‘this is the way we’ve always done it camp,’ it will take the right change agents in your organization to take the leap,” he explains. Organizations that have a native growth mindset and are adaptable to change will be rewarded. Traditional challenges for direct mailers also include shorter runs. This remains today, but with greater intensity. “Today, the runs are becoming shorter due to the specificity of the audience receiving the mail piece,” explains Nick Gerovac, director of sales & marketing, VITS International. In the past, a direct mailer would print enough pieces to blanket a market with their message. Today, direct mailers print specifically for each individual recipient—reducing overall distribution. According to Gerovac, other modern challenges faced today but not seen in traditional direct mailers include capital investment and data mining. To take advantage of specific direct mail pieces, he believes the printer needs to invest in new technology. This includes inkjet imaging to enable personalization or full digital presses to fully implement complete variability and message specialization. Additionally, Gerovac says data mining enables the ability to collect and interpret the data so that a relevant, targeted direct mail piece can be created. As direct mail faces competition from electronic solutions, print remains relevant due to its tangible, value-added, and customizable features. Corry Casler, executive director, PressWise by Smartsoft, believes marketers shouldn’t feel the need to choose between electronic solutions or print. “If marketers are clever in their direct mail piece design, for example using unique papers, tactile coatings, and providing meaningful content, they will enhance their campaign,” she comments. Furthermore, working with electronic and print solutions simultaneously reinforces the message and makes marketing efforts more active and attractive. “Print remains not only one of the most relevant marketing mediums, but the most powerful,” says Chris Lien, president, BCC Software. According to the DMA, Lien says direct mail sees a 5.1 percent response rate for house lists and 2.9 percent for prospect lists, while all digital counterparts combined only have a two percent response rate. “Plus, print is tangible, personal, and secure—the USPS remains a highly trusted agency,” he adds. Andrew Schipke, VP sales and marketing, W+D North America, agrees and notes the DMA and many other research organizations find that direct mail’s response rates are actually anywhere from ten to 30 times higher than that of digital. He says studies also show that consumers, overwhelmed by inboxes cluttered with unsolicited marketing emails, are more receptive to direct mail, which arrives on a much less clustered marketing channel. Trends like AR, omni-channel marketing support, and analytics affect the direct mail segment of print. While direct mail generally has a higher response rate than digital campaigns, it doesn’t mean that marketers who utilize direct mail are ignoring digital. In fact, it’s the exact opposite. “Omni-channel marketing is essential for effective campaigns, and you can’t have omni-channel marketing without print,” says Lien. Thanks to advancements in the industry, direct mail is now strategically tied to compliment digital messaging. Industry trends allow omni-channel marketing to be compelling, generating high response rates. And, the USPS follows suite with Informed Visibility, says Lien. Similar to the previously mentioned Informed Delivery offering, USPS’ Informed Visibility is a mail tracking platform designed for mailers that provides essential data needed for strategically timed direct messaging by giving users enhanced insight into the delivery of their mail paces. Scott Draeger, VP, Quadient, finds that the combination of multiple technology skills—AR, omni-channel marketing, and analytics—will ultimately create leaders in the market. He believes AR increases the direct mail piece’s lifespan and the way people show it to others—increasing outreach. Additionally, analytics show that the printed piece is the dominant performer in segments and omni-channel marketing adds extra value by making it easy to convert a print-based direct mail piece to a digital order. “When combined, the direct mail company that plays well with the emerging technologies will win a larger share of wallet from their client by becoming a communication vendor that happens to provide direct mail,” adds Draeger. “Omni-channel, targeted data, and great analytics increase response rates significantly,” agrees John Barber, president, Summit Direct Mail. “By tying direct mail to the internet via marketing automation, our clients are increasing overall response rates and lowering their cost of acquisition of customers.” In fact, he says mail houses started embracing SMS text, email, ringless voicemail, and marketing automation to create multi-channel marketing campaigns. Today’s direct mail houses adapt to the era of digital transformation. To embrace digital, direct mailers look at workflow. When direct mail is printed exclusively with offset, Mansfield says every piece off the press is identical, with addressing typically completed as a separate offline process. When a direct mail printer implements a production inkjet process—webfed, hybrid, or sheetfed—he says they must also invest in variable data authoring software, a RIP architecture that keeps pace with the press’ speed, and an inspection system to ensure the direct mail piece is received by the appropriate recipient. Additionally, direct mail houses adapt to digital transformation by investing in modern finishing equipment. “If the printing company intends to offer direct mail documents that vary in page count based on the recipient, it may also be necessary to invest in one of the new breeds of finishing lines that dynamically adjust for this—dynamic perf/punch or variable page count booklet making,” comments Mansfield. Other direct mail houses take a different approach to digital transformation and consolidate to perform the same work on a larger scale. “This is where print innovations can make some amazing applications at incredible speeds,” comments Draeger. In addition to consolidation, direct mail houses focus on one segment or communication type. This can be a horizontal application, like loyalty programs, or vertical, like automotive. Another way direct mail houses adapt is by using digital inkjet solutions to do more testing of what offers, messages, and designs work best for their list. Before investing in large print volumes, designers and marketers conduct A/B testing. According to Maureen Brock, VP, Memjet, these tests involve running a small campaign that compares two versions of a direct mail campaign to see which version performs best. “Inkjet printing solutions provide an ideal way to support these tests,” comments Brock. Designers are able to produce a small run test campaign to see how well it performs in the field. If it does well, they can produce the campaign at a higher volume on the same digital press. United Printing & Mailing is a direct mail provider that evolved with modern demands. Established in 1965, the print provider started in Phoenix, AZ with 12 employees. From the start, the company focused on direct mail. It originally produced the majority of its work with litho-based technology. In 2004, the direct mailer saw a spike in digital printing needs and adapted by investing in the technology, says Ashley Jorgensen, marketing director, United Printing & Mailing. Today, the company operates with 70 team members as a high-volume direct mail partner that specializes in servicing high-volume accounts and agencies. 100 percent of its work involves direct mail campaigns. Everything is printed and mailed in house with on-site USPS verification. Over the last ten years, direct mail campaigns evolved immensely. “We have seen a massive spike in digital-based printing because consumers these days want personalized pieces addressed to them with offers and information that speak to their direct interests. Personalization goes a long way,” admits Jorgensen. For all its digital needs, United Printing & Mailing uses a variety of presses including the Océ VarioPrint 6160 from Canon, Ricoh Pro C9100, and a Ricoh 8200 B&W press. “We love both of these brands and machine types because they are high-quality workhorses for an affordable price,” says Jorgensen. In addition to digital printers, United Printing & Mailing uses targeted direct mail software from BCC Software. According to Jorgensen, the company chose this brand for its powerful expressions tool and ease of training. “BCC’s features and flexibility are amazing,” she adds. Despite success with its direct mail campaigns, the company has seen slight decreases with direct mail competing against electronic solutions. But overall, the direct mailer experienced an increase in direct mail usage due to the influx of digital advertising. “People have adapted and learned how to ignore digital advertising while using their favorite websites, applications, etc. We have found that the most successful marketers pair direct mail with digital efforts and/or email campaigns. The tangibility of direct mail is unbeatable,” concludes Jorgensen. Advancements in direct mail continue to expand in the printing industry as new trends like USPS’ Informed Delivery and Informed Visibility grant customers and direct mail houses more control.